Have you ever poured a pint of your favorite beer and thought, 'Damn that looks good, but it could be better if it looked more like me.' It's a common problem. You pour that perfect glass of Hooey with a gorgeous golden haze or get that creamy toffee-colored head of Darkness, but it isn't literally smiling back at you. Guinness has been working on this issue, and they have a solution. At the Guinness Storehouse in Dublin, you can now buy yourself a STOUTie. It's like a selfie for stouts, obviously*. Starting November 1, you can order a pint that features your mug in your mug. It's your head in your beer's head. The selfie in foam is made with a natural malt extract that is added to the top of the beer. 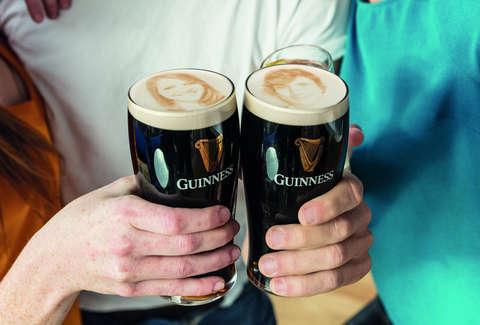 With your visage made of malt, it's drinkable and shouldn't hinder the iconic flavor of your Guinness. The ridiculous, but kind of fun gimmick is made possible by Ripples technology, which uses 3D printer mechanics with ink-jet printing. "Ripples is known for offering brands the possibility to create unique, personalized consumer experiences by printing image or photo content onto foam-topped beverages," Ripples CEO Yossi Meshulam said in a statement. "We are thrilled to partner with Guinness for the STOUTie launch, exciting beer lover by making their beverage unique." The STOUTie is only going to be available in Dublin and not at the new U.S. taproom in Baltimore, Marland. * That was not necessarily obvious.